Gretchen McCulloch last explained exactly how the Benedict Cumberbatch name generator works. If you spend time on the meme-ish corners of the internet, you’ve probably noticed a certain trend in captioning pictures of shiba inus, known as doge, although there’s considerable disagreement about how to pronounce the word itself. You’ll notice that unlike the LOLcats of yesteryear (which have actually had a thesis and an academic paper written about them), the font choice is Comic Sans instead of Impact, multiple fluorescent colours instead of white with a black border, and all lowercase instead of all caps. Spelling overall is quite standard, which is very different from classic internet memes (more on this later). In fact, you don’t even need a picture of a shiba inu. Here’s doge speak on a portrait of the ruler of Venice (a position that has been known as doge, a variant of duke, since the Middle Ages). I’m almost definitely sure that the internet wasn’t a thing during the Middle Ages. So if it’s not the shiba inu or the fluorescent comic sans that makes a text doge, then what is it? I’m so glad you asked. Let’s put our linguist hats on and get ready to analyze. A minimal doge utterance contains at least two but often three 2-word doge phrases, followed by a single-word doge phrase (most commonly wow). Additional phrases and variants can be added, especially for the sake of cultural references, such as can’t believe it’s not doge or dogeway to heaven but they are not what makes an utterance recognizably doge. What makes a recognizable doge phrase? 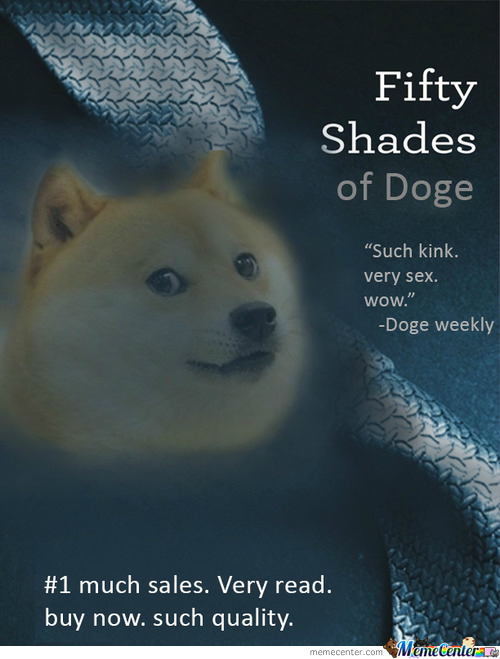 The two-word doge phrases, though, are really interesting. The first word comes from a limited set (essentially so, such, many, much, and very) but in order to understand how you pick which word follows the first one, we need to talk about a thing called selectional restriction. Put simply, certain words go well with some words, and other words go well with others, and when you don’t obey that, things get weird. One example are the words much and many. Both of them basically mean “a lot,” but much goes with amorphous masses and many goes with individual countable items. So if you say “much wine was consumed,” you’re talking about a large sea of wine, but if you say “many wines were consumed,” you’re talking about many individual wine-items, in this case probably types of wine like Pinot Grigio or Merlot. But some combinations are better than others: “many wine” or “much wines” is definitely not in the canon of Standard English, but sounds excellent in doge speak. The same thing goes for other words that have selectional restrictions, such as so and very which typically modify adjectives. So you can say “The wine was so/very delicious” but normally you wouldn’t say something like “so wine” or “very wine”: except, of course, in doge. And what do you put with adjectives like “delicious” in doge? Well, you could combine them with much or many, which we’ve seen normally modify nouns. Okay, so what about such? Such normally selects for noun phrases, that is, a noun and optional other items: “such a delicious wine,” “such a wine,” “such delicious wines,” “such wines.” Since many of these combinations contain three or more words, they’re instantly out as possible doge phrases, meaning that such is one of the most versatile doge modifiers: it can combine with both nouns, like such wine, and adjectives, like such delicious. Of course, since none of the five main doge modifiers (much, many, so, very, such) are ever found with verbs in canonical English, all of them are candidates to modify verbs in doge: for example, much eat, many eat, so eat, very eat, and such eat would all work for doge speak. Other modifiers such as quite, rather, and even lotsa are also found more rarely in doge, under similar principles of mismatch. You can definitely still find some examples of people using doge speak that aren’t quite as ungrammatical as I’ve described above. But they’re fairly rare, especially among the most popular examples of doge speak, so I’d argue that these people are in fact not quite as adept at doge as their more playfully ungrammatical internet neighbours. An example that proves my point conveniently popped up on my Facebook while I was writing this, showing someone actually correcting someone else’s use of doge modifiers to be more ungrammatical. Friend #1 (posting link): Doge is a rescue dog. Much respect. So noble. Wow. Why do shiba inus speak ungrammatically? But what is it about shiba inus that makes them violate the selectional restrictions of certain English modifiers? Even if you’re a devoted animal fan and you swear that Fluffy understands you when you talk about dinner or the vet, I highly doubt you think that Fluffy actually talks back in English sentences, grammatical or not. And, I mean, dogs are both colourblind and renowned for their sophisticated taste in typography so they would clearly never arrive at multicolored Comic Sans as a font of choice. The real source probably comes from a combination of two other influences: how we as humans talk to our pets, and how we talk to each other on the internet. The first factor is the kind of “baby talk” that we do towards our pets, known in the literature as pet-directed speech (yes, there are actual studies on this). It tends to involve speaking with exaggerated pitch and using simplified sentence structure. By comparison, the “baby talk” that we do towards actual children involves these two factors plus extra-precise articulation of sounds and is known as infant-directed speech (formerly motherese until some genius realized that it’s not only mothers who talk to babies). But of course, if we speak to our pets in baby talk or simplified language, then it’s only logical to assume that when we anthropomorphize our pets, they’d speak back to us the same way. So doge and its predecessor LOLcat tell us nothing at all about dogs or cats but everything in terms of how we’re talking to pets and to each other on the internet. The second factor that goes into doge is the general principle of internet language these days that the more overwhelmed with emotions you are, the less sensical your sentence structure gets, which I’ve described elsewhere as “stylized verbal incoherence mirroring emotional incoherence” and which leads us to expressions like “feels,” “I can’t even/I’ve lost the ability to can,” and “because reasons.” Contrast this with first-generation internet language, demonstrated by LOLcat or 1337speak, and in general characterized by abbreviations containing numbers and single letters, often in caps (C U L8R), smilies containing noses, and words containing deliberate misspellings. We’ve now moved on: broadly speaking, second-generation internet language plays with grammar instead of spelling. If you’re a doomsayer, the innovative syntax is one more thing to throw up your hands about, but compared to a decade or two ago, the spelling has gotten shockingly conventional. 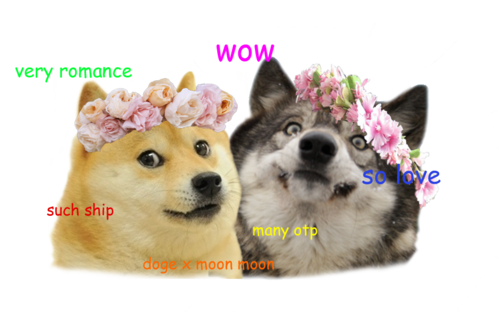 In this sense, doge really is the next generation of LOLcat, in terms of a pet-based snapshot of a certain era in internet language. We’ve kept the idea that animals speak like an exaggerated version of an internet-savvy human, but as our definitions of what it means to be a human on the internet have changed, so too have the voices that we give our animals. Wow.